Earlier this week we created a KML file to allow you to preview the latest Sentinel imagery. 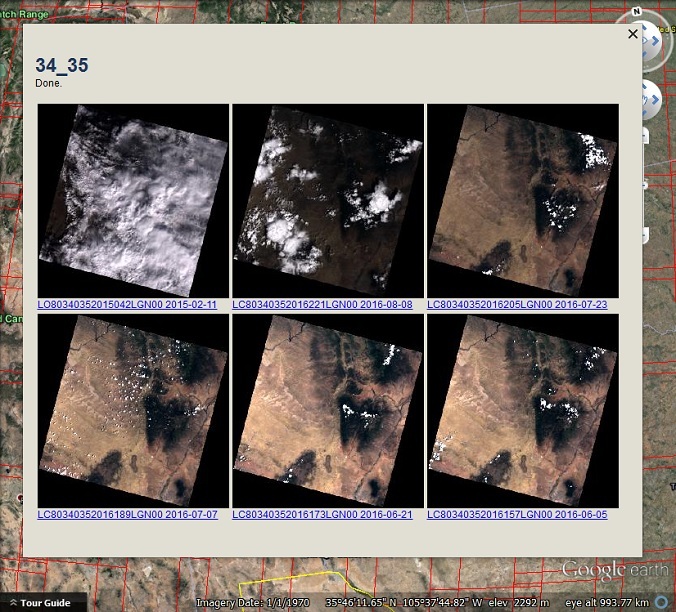 We used the fact that Sentinel imagery is available via Amazon Web Services (AWS). Given that Landsat 8 imagery is also available on AWS we thought it would make sense to do the same for Landsat 8 imagery. Simply download this KML file , and click on any tile and it will show you the six most recent Landsat 8 images for that tile. Clicking on the link below the image takes you to the relevant AWS download page. On the AWS download page, click the thumbnail to see a much larger thumbnail. Would you care to elaborate? I tried this file and while I *do* get a preview and some tiles, when I click the preview and load the AWS page, what I get is a list of files. I downloaded all the TIFFs, presuming they are usable (*_B*.TIF), however they are flat gray/black or grayscale, not color, like the preview. The imagery is provided in the various colour bands that Landsat 8 captures. To use it, it needs to be processed combining the appropriate bands. One way to do this is nearly the same procedure as given in this post but it is more difficult if you want the best resolution as you have to merge in the panchromatic band. There are also commercial products such as this one from Geosage that can do most of the work for you. Landsat is 30 m per pixel, colour which can be improved to 15m per pixel with the panchromatic band so not high resolution at all. Sentinel imagery is better at 10 m per pixel but still nothing like as good as commercial imagery. Planet Labs produces higher resolution imagery and I believe they have made imagery of California available for free, but I have not looked into it in detail. Sentinel and Landsat imagery are best used for very large scale phenomena that you want to look at soon after the event before imagery from Digital Globe is released, or when you want to see large scale changes over time. OK, that explains everything, thanks!